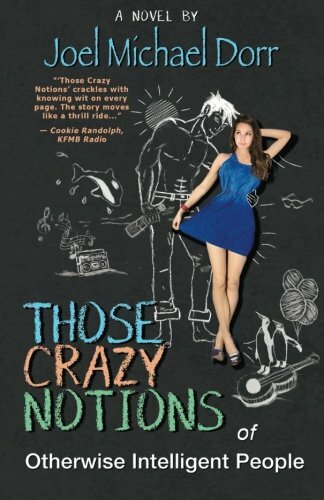 In “Those Crazy Notions of Otherwise Intelligent People,” Joel Michael Dorr tells the story of protagonist, Percy Powers, a cocky, sarcastic, womanizing radio show host and beautiful, timid, Ilena Doran. Ilena helps abused women in addition to being a full-time mother to her traumatized young son. Percy and Ilena meet by happenstance due to Ilena’s son winning a contest put on by Percy’s radio station. They both have their preconceived notions and judgments about one another at their initial meeting, yet the more time Ilena spends with Percy, the more she realizes people aren't always who they appear to be. Percy Power’s character was the best part of the book. Written as a dynamic, complicated character, Percy is a protagonist in dire need of a character arc. Percy’s sarcasm is both humorous and trying on the reader. However, it is apparent in the writing that Percy’s sarcasm is used as a defense mechanism for his internal pain. In the book, the back stories are introduced piece by piece, which makes for an unpredictable read. The back story isn’t given away in dialogue or exposition right after it is introduced, instead the plot is further discussed in the following chapter(s) or through a shift in character focus. The warm heart and strength of the character of Ilena is consistent throughout. She possesses a quiet power and resilience that was endearing. This is Dorr’s debut novel. It is clear he had fun writing the dialogue and the quirks of Percy. There is a section at the end of the book that was formulaic due to a “misunderstanding,” however, as a telling of a modern romance, the ending was still cute and entertaining. Dorr has a fun, quippy writing style; however, “Those Crazy Notions of Otherwise Intelligent People” struggled with continuity issues. For example, a phone call goes dead, but it is described soon after that the caller was still on the line. Even though telling the plot in pieces made for a more enjoyable reading experience, it affected the overall continuity. There wasn’t much time to adjust to the quick story telling of the events that transpired and the characters progression. To conclude, “Those Crazy Notions of Otherwise Intelligent People” is a strong debut from Joel Michael Dorr that is loaded with humor, quirky characters, and snappy dialogue. There are adult themes in the book such as sexuality and language that makes this novel inappropriate for the age group of fourteen years and younger. “Those Crazy Notions of Otherwise Intelligent People” is a recommended read as everyone has been in the position of having assumptions towards others and later finding those assumptions to be wrong. It is what makes the story so endearing and heartfelt.